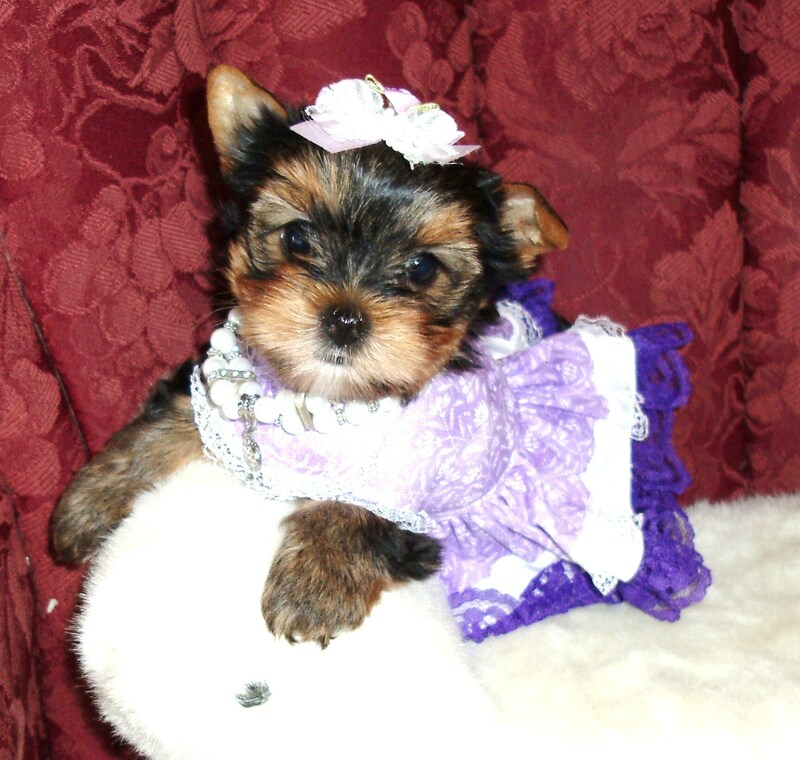 Please go to my facebook Page to see puppies at Natalie's Little Yorkies Yorkies For Sale I can no longer work on this website. I will have to figure out how to build a new one. Sully is a very sweet cuddly little boy and most likely is done growing. He is AKC reg. 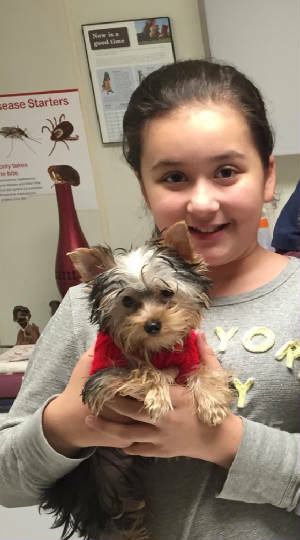 and warrantied and comes with open registraion papers he has all his vaccinations is ready to go home and also he has both of his little jewels that have dropped he comes from many generations of tiny genetics . for more information call or Text 605-214-1536 I also have more pictures of him if you would like to see them. 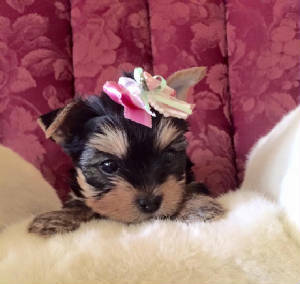 Little Tiny yorkie for sale Rita - SOLD. Sunshine has a personality just like his name he is such a happy little boy so full of love and joy. He is AKC reg. and warrantied and for more information please text 605-214-1536 or call i have a lot more pictures of him I can send you. 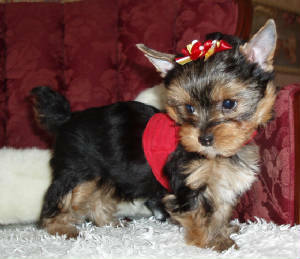 Destiny is the sweetest of sweet she has a very cuddly personality and she most likely will bea 4 to 4.8-lbs full grown. 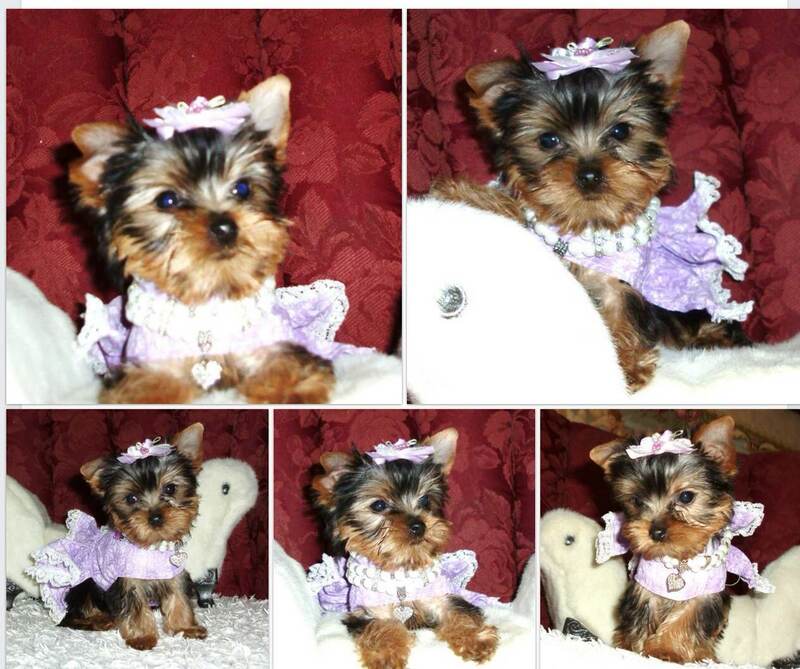 She is AKC reg. and warrantied. for more pictures please send me an email or give me a call I will be happy to send them to you. 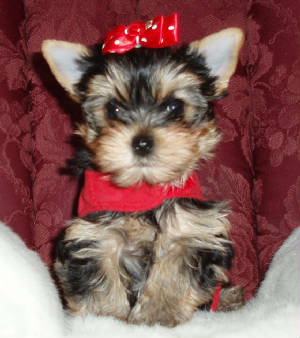 around 5-lbs full grown. 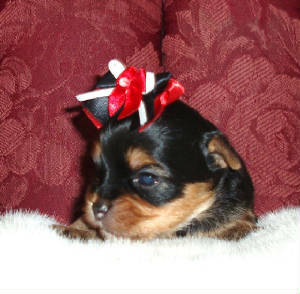 She is AKC reg. and warranited . 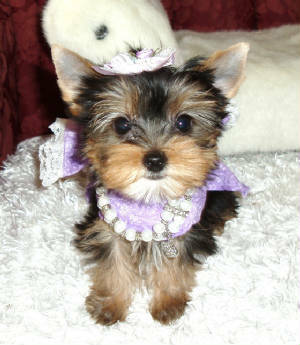 She would make a wonderful breeder female or a very nice pet. Weight - 1 lb., 8 oz. 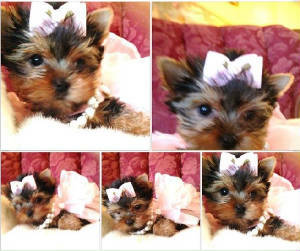 Little Paige is a beautiful little girl. Her mother is a gold and white parti female and her father is my Sudan Park Ridge. 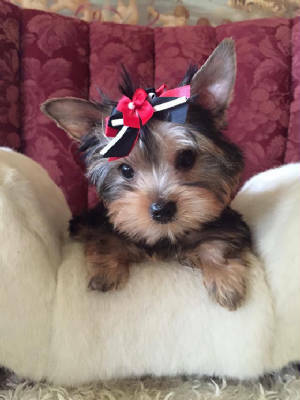 Paige will make a wonderful breeder female or just a perfect pet. 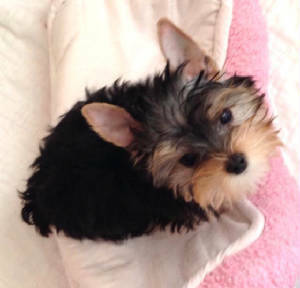 Dinky is a very tiny little boy he comes from many generations of tiny tiny yorkies. 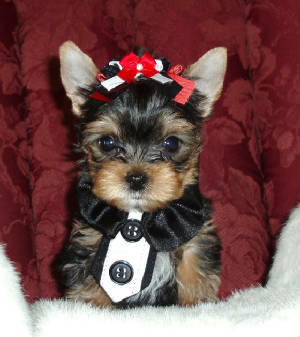 He has a sweet cuddly personality and he is very short legged with a short little nose and a beautiful silk coat. He is AKC reg. and warrantied. 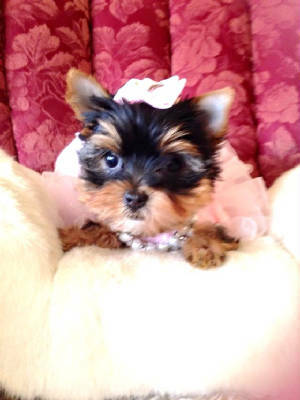 Princess is a beautiful breeder female. She has quality bloodlines with many champions in them. 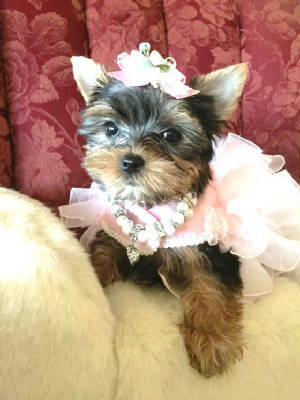 Princess has a very happy personality and is AKC reg. and warrantied. Daisy is a very sweet cuddly little girl. 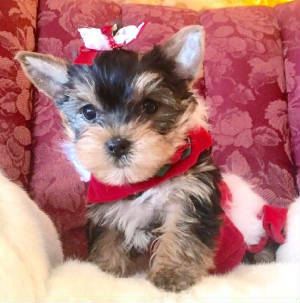 She most likely will be about 2.8 lbs. full grown. 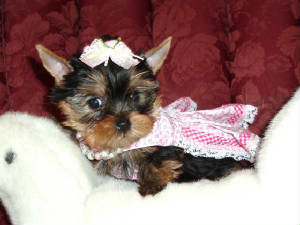 She is AKC reg. and warrantied. For more picture, please call or send me an email I will be happy to send you more pictures or speak to you. 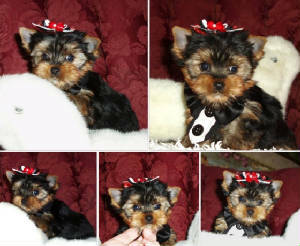 To hold a "yorkie puppy for sale" until it is ready to go home a $500.00 dollar non-refundable deposit is required. 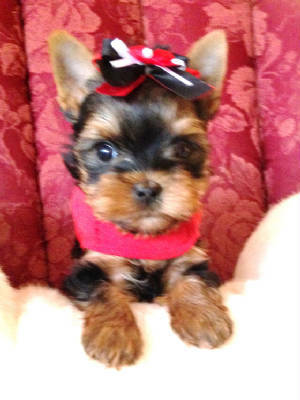 All Puppies must be paid for in Full by the time they are 10wks old. 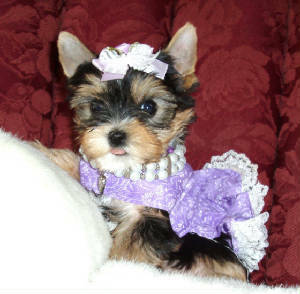 All my Yorkie Puppies are sold with "Limited" registration or on a spay/neuter contract. 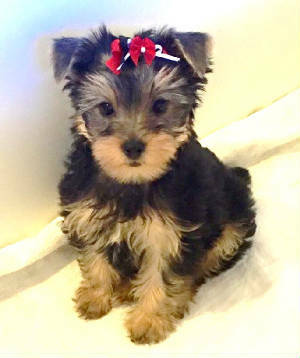 If you're interested in "Full" registration on any of my yorkie puppies for sale you must make arrangements with me before purchasing your Yorkie puppy!!!! Hypoallergenic: These dogs have hair like humans. 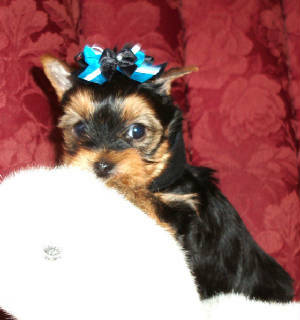 They do not shed and anyone with allergies can own one they are hypoallergentic. Temperament: Bold, Confident, Courageous, Intelligent, Independent. very good with children and family. 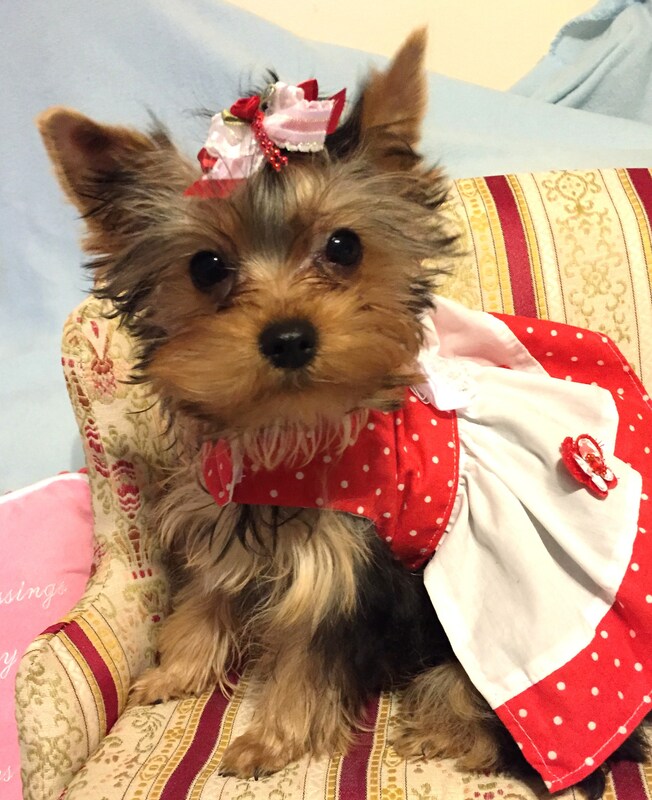 Click here to see new Dog clothes for sale!!!! Shipping available to all states. If you don't see what you want here you can also visit my friend website at the website listed below. 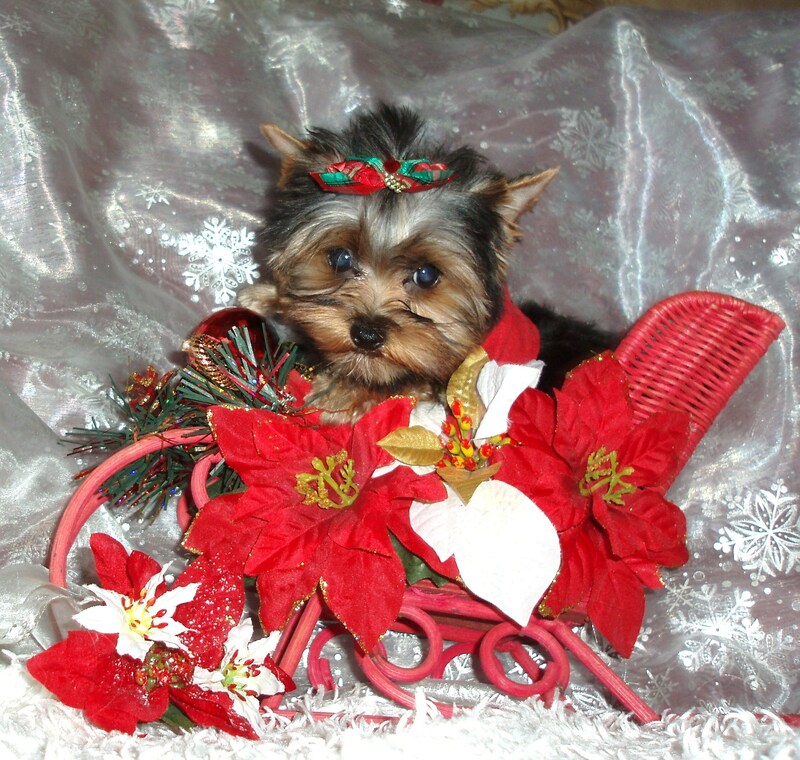 This little guy is totally all boy he loves to run and play and would do wonderful with children he is AKC reg. and has top of the line bloodlines. He is AKC reg. and warrantired UTD on all vaccination and has been vet checked. for more pictures and information please text me at 605-214-1536 or feel free to give me a call. 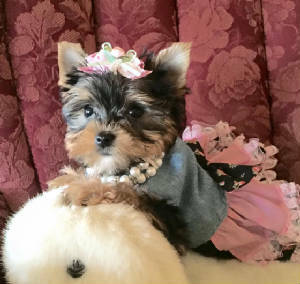 5-lbs full grown. He is just a gorgeous boy with a super thick coat and a doll face! 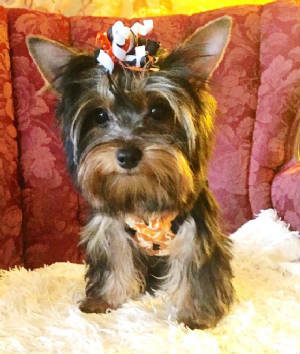 rare find these days for a parti yorkie. 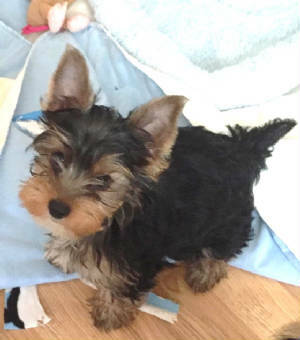 This little boy is just perfect he has a very short nose, short legs tiny ears and a very cobby body. 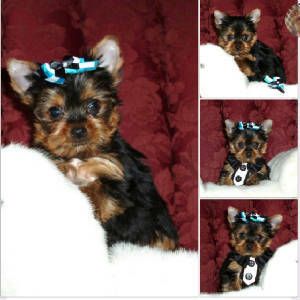 He most likely will be around 3-lbs full grown he is AKC reg. and warrantied. He will be ready to go home for Christmas. I am now accepting deposits for Lance. He is AKC reg. and warrantied. and I can keep you up dated with pictures and videos every week until he is old enough to go home in Nov. 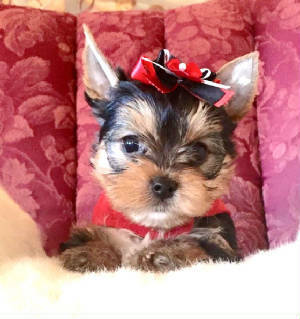 This is little Lacey she was born on 08/04/14 her parents are Sasha and Loverboy Lewie her current weight is 6 ozs and I am accepting a deposits at this time. 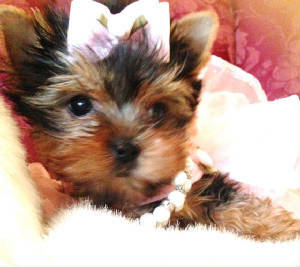 I will keep you up dated with pictures and video's until she is ready to go home in Nov. Weight - 1 lb. 12 oz. 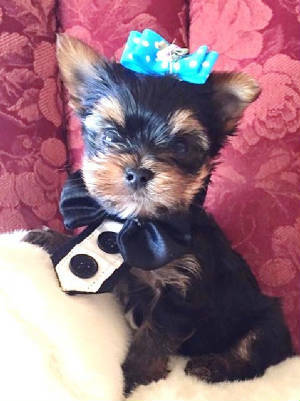 Prince is a beautiful little boy. He has a fun-loving personality. 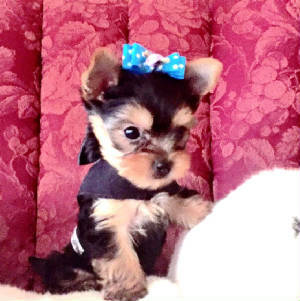 Prince is AKC reg. and warrantied. Parker is a very sweet little boy. He loves to lay in my slippers and his favorite pass time is tug a war with his brother. 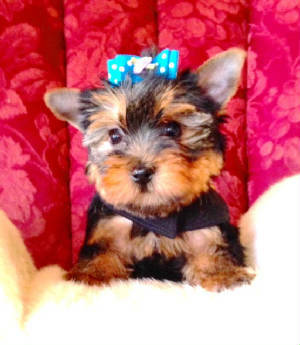 Parker is AKC reg. and warrantied. 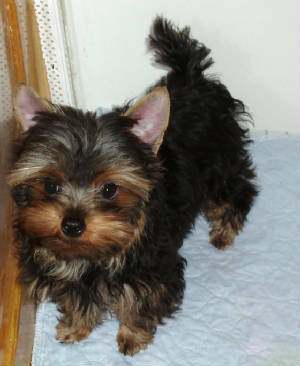 Danny is a very tiny little boy and he has the sweetest personality he is AKC reg. 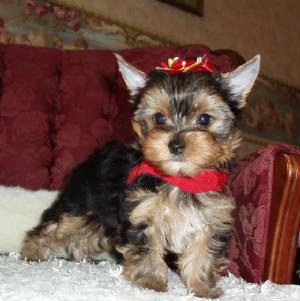 and warrantied and most likely will be about 2.8-lbs full grown. 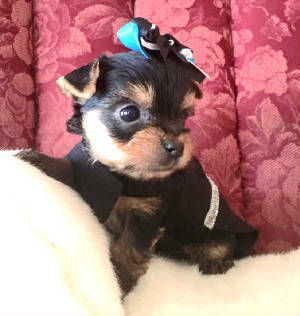 Bentley is a tiny little yorkie. He has quite the personality. He loves to play but also loves to snuggle. 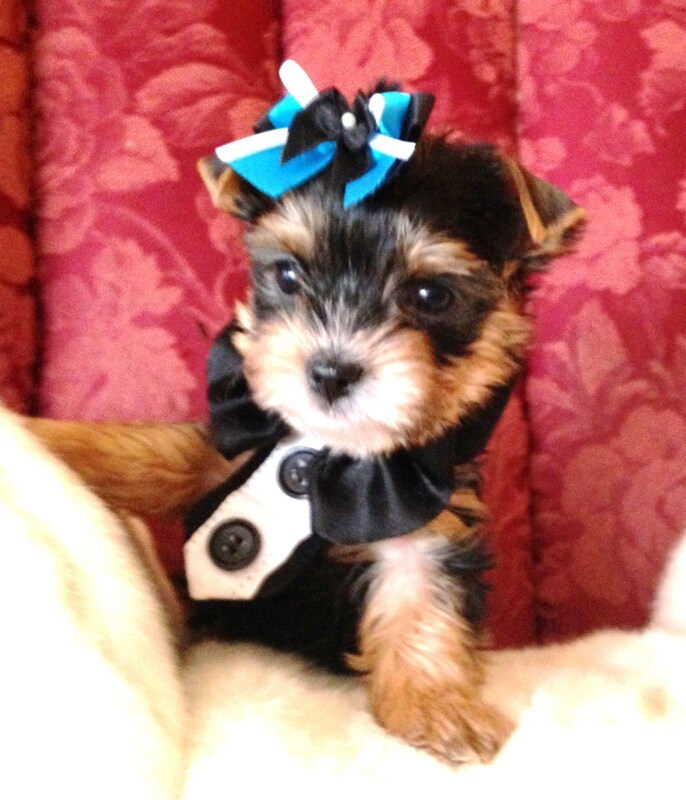 Bentley is AKC reg. and warrantied. For more information and pictures, please call Natalie at 605-882-214-1536 or send an email I will happy to answer any other questions you may have. 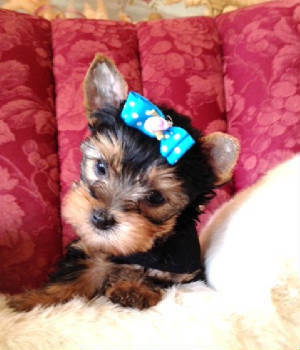 Sally is a very happy friendly little girl and she will be tiny. 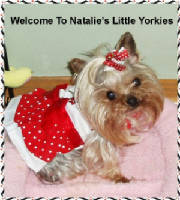 She is always ready to greet you when you walk in the door and she has a very happy go lucky spunky personality. 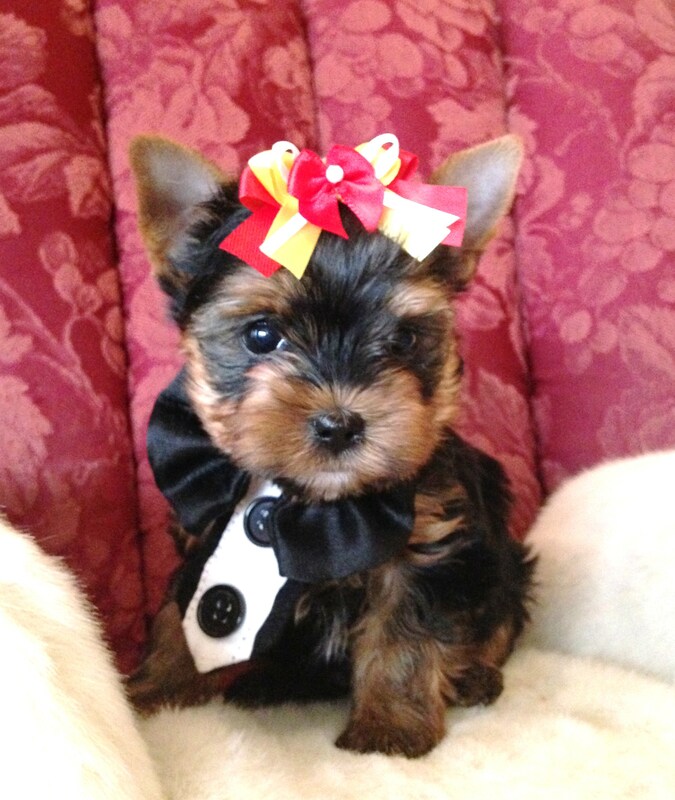 She is AKC reg. and warrantied and is vet checked before she goes home as well as UTD on all vaccinations. 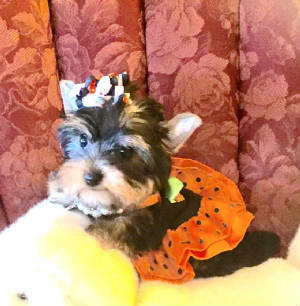 If you have any other questions about Sally please fell free to give me a call I will be happy to answer any questions you may have and send you more pictures. 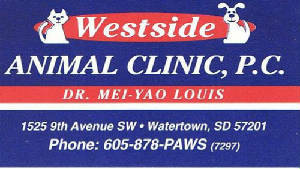 Best place to buy wee wee pads these are the cloth pads you can put in the washer and dryer these are the pads I use for my dogs. 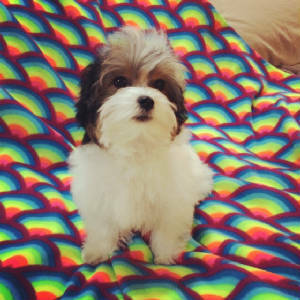 When you need to housebreak your puppy, Doggypads.com provides you with high-quality puppy training and adult dog wee pads. 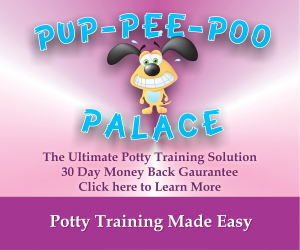 They are the most effective way to potty-train your puppy and prevent those horrible weewee accidents. Hello, My name is Natalie Nelson. 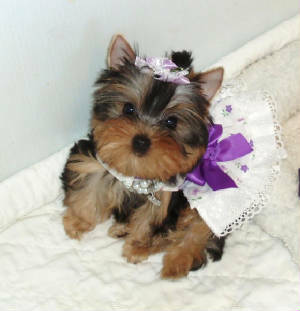 I live in South Dakota and I breed yorkies. 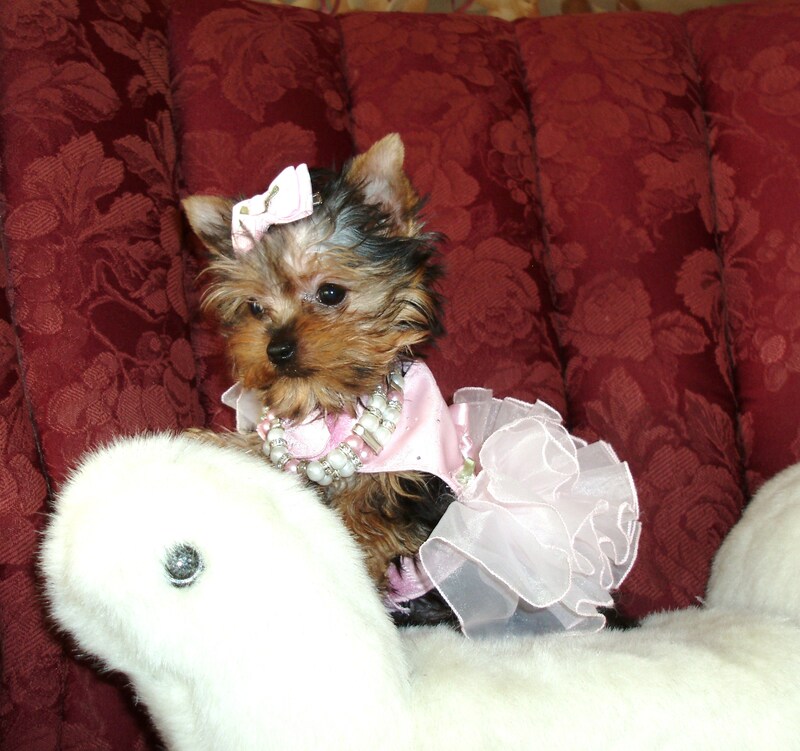 I have specialized in raising and breeding teacup and show quality Yorkshire Terriers for nearly 30 years. 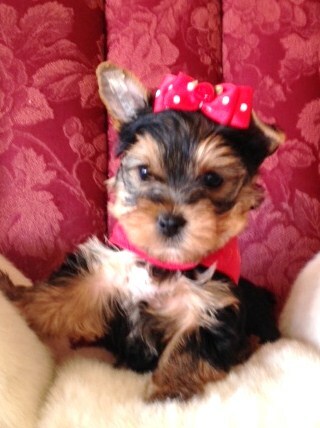 All my yorkie puppies are raised in my home with lots of TLC and as part of my family. 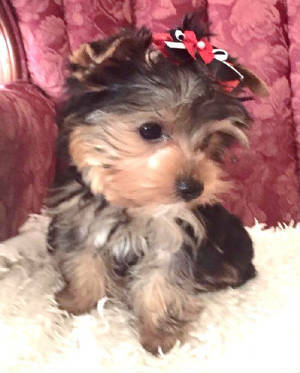 When my tiny yorkie puppies are full grown they will weigh 2 to 4 lbs.They come from a long line of teacup Yorkshire Terriers that have been specially bred from my own lines. 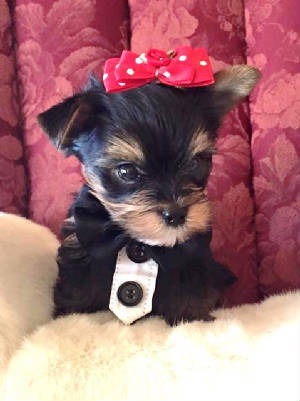 This line originates from my 1-lb 4oz male Burgundy Wee The Cookieman and Natalie's Little Katie and Heidi from Eden Valley yorkies who both weighed 3.8-lbs. 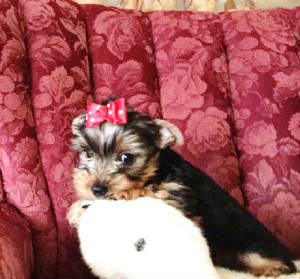 All show quality Yorkshire Terrier puppies for sale are 4 to 7 lbs. 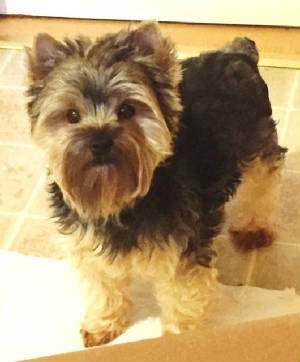 and originate from my Ch- Ziggy Boy De Bigafa from Canada, Ch- This Time Major League At Dundry and my Lake Buena Vista Ch- Camila, Lake Buena Vista Raissia, and Lake Buena Vista Ullie from Brazil. 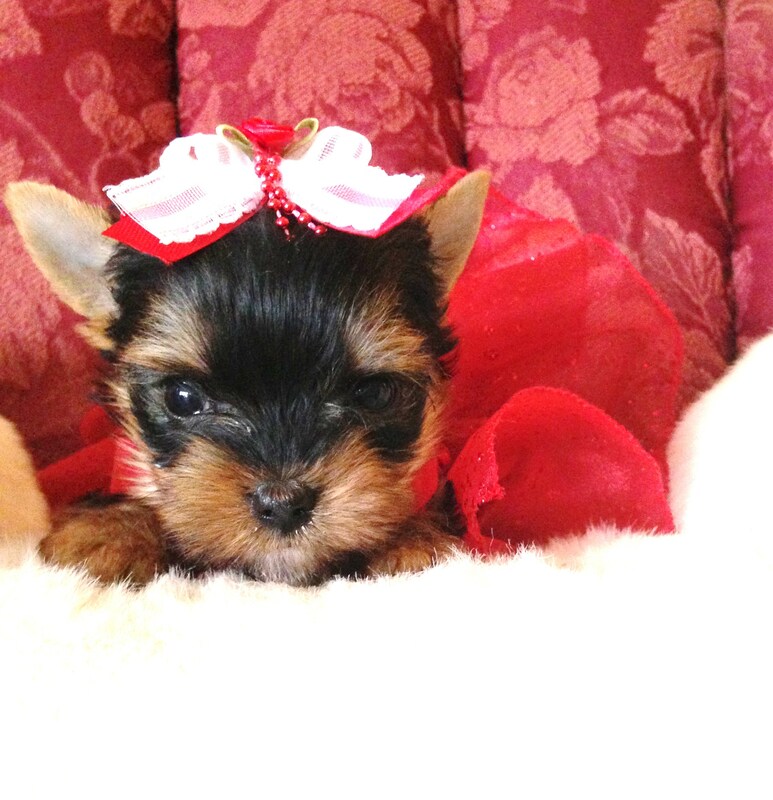 These puppies will only be sold to very special homes to show or with limited papers as pets. 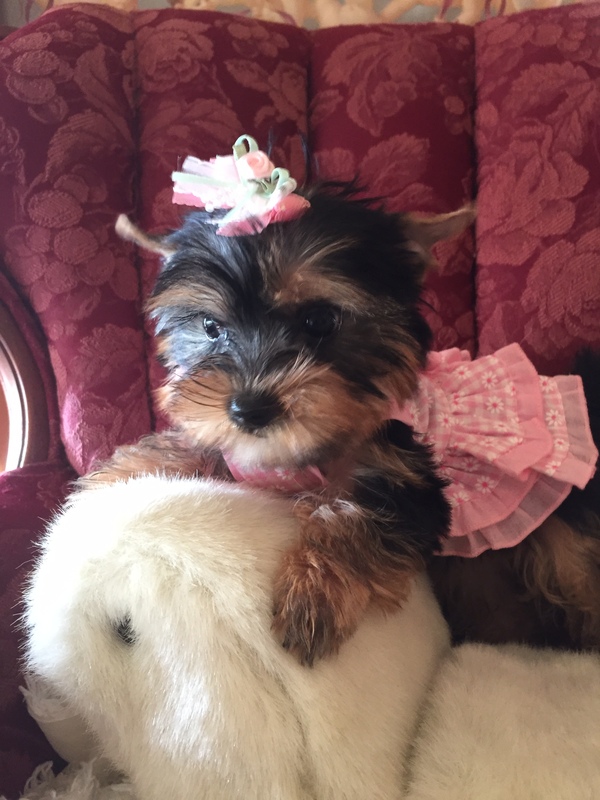 All my puppies have very good temperment, and are quality AKC registered Yorkie puppies, vet checked, up to date on all vaccinations, and warrantied for 1yr from date of purchase. 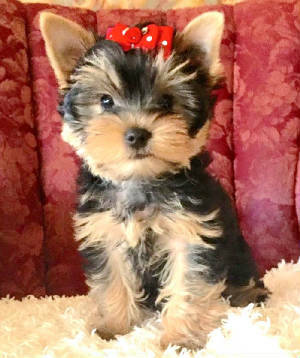 Here are some of my Yorkshire Terrier bloodlines: Ch-Ce De Higgins,Ch-Clarwyns Jubilee Eagle,CH- Rothby's Renne ' Gade ,CH- Durrer's Goody Goody, Ch- Pastoral Johnny Handsome, Ch- This Time Major League at Dundry, CH-Lordean's The Angel Maker. 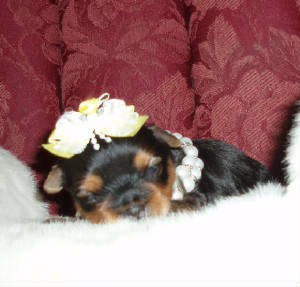 Burgundy Wee Valentino, CH-Yorkboro One Step Closer, Ch- Lake Buena Vista Camila from Brazil, and Ch- Ziggy Boy De Bigafa from Canada. 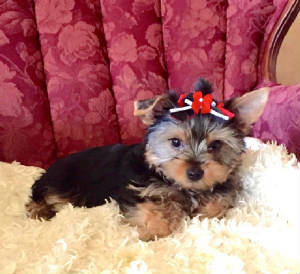 Each Yorkie puppy for sale is unique in its own way, ranging in color, features, personality, and are all AKC registered. 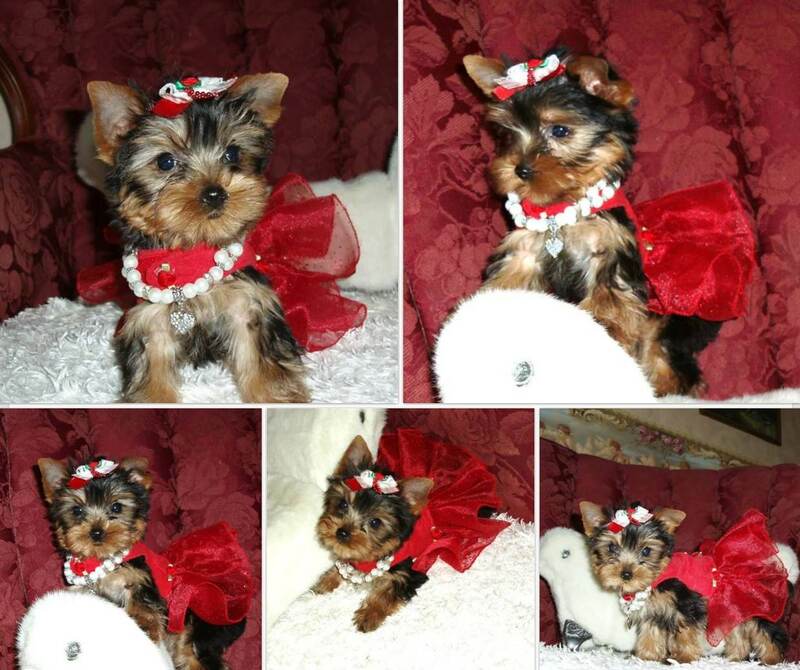 All my yorkie puppies for sale come with a 5 generation pedigree. 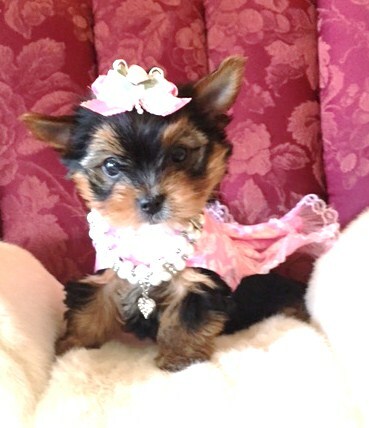 If you would like more information about my current yorkies for sale or my upcoming litters of yorkie puppies and would like to purchase one of these special little gifts from God, to bring joy into your home. 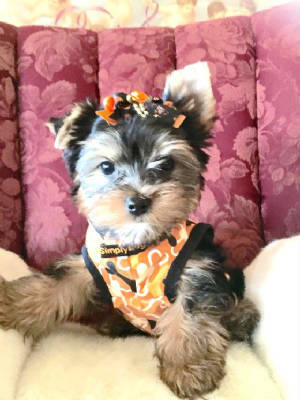 Contact me at home at 605-882-0553 if you have any questions concerning my yorkies, I will be happy to answer any questions you may have or help you with any questions you may have about Yorkie puppies. 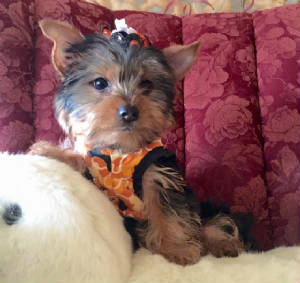 "HAPPINESS IS A WARM YORKSHIRE TERRIER PUPPY"
Hello I'm Natalie! 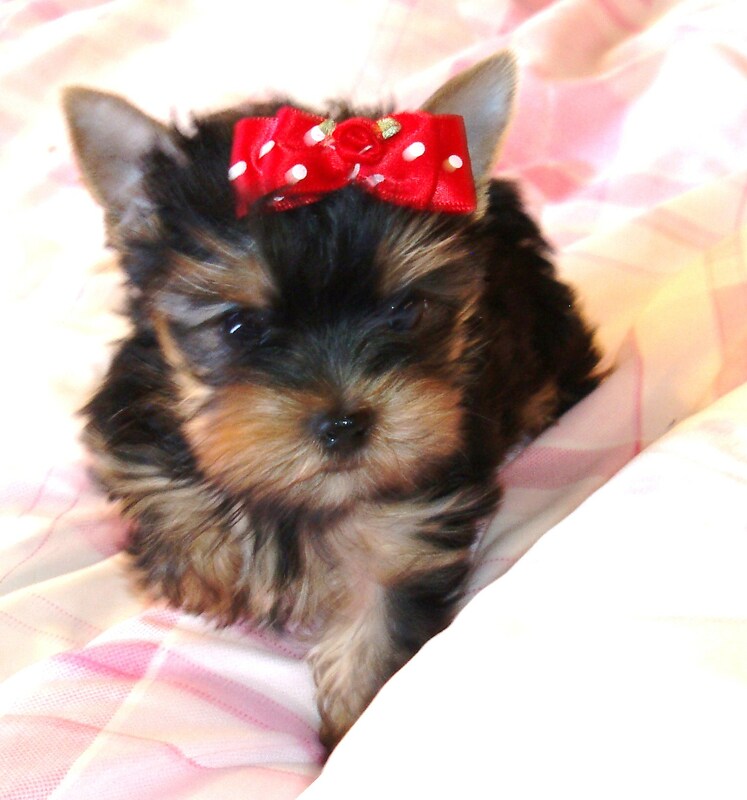 Thank You For Visiting My Yorkshire Terrier Yorkies for sale Website! Someone to comfort, to dry up your tears, Someone to be there, To quiet your fears, A companion, a pal, a very best friend, Someone to trust and to love ' til the end. 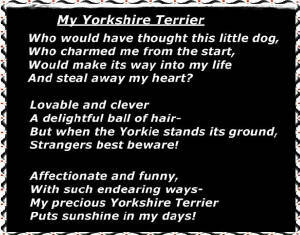 This is what my yorkies have done for me in my life they are the one very special gift god has blessed me with and I will be forever grateful to God for putting them into my life. 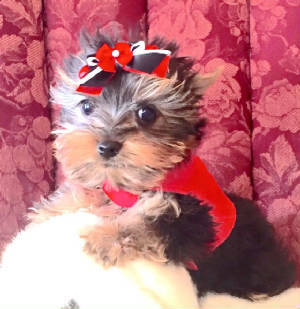 All pictures and content of this website are property of Natalie's Little Yorkie's and may not be copied under any circumstances.